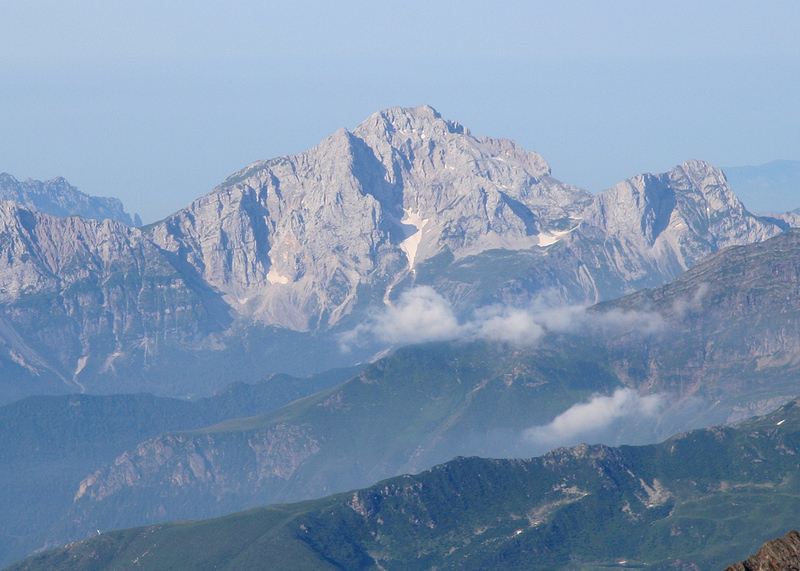 This mountain is located quite close to the city of Milan. From Milan, drive (on the autostrada) north-east to Bergamo, where you continue north-east on Hwy. SS671 (look for signs to Clusone). Before Clusone, fork left and continue north-east on Hwy. SP49, there are signs for Valbondione. The small village of Valbondione is located at the end of the valley, there is a small ski resort town with several hotels called Lizzola that is located about 7 kilometer uphill (south-east). When you arrive at the road-fork where there are signs for Lizzola going right, continue straight ahead (the left fork) for 700 meter, then locate a small parking area on your left. There is space for 5-7 cars here. Park here, this is the trailhead, location N46:02.492, E010:00.928, elevation about 939 meter. 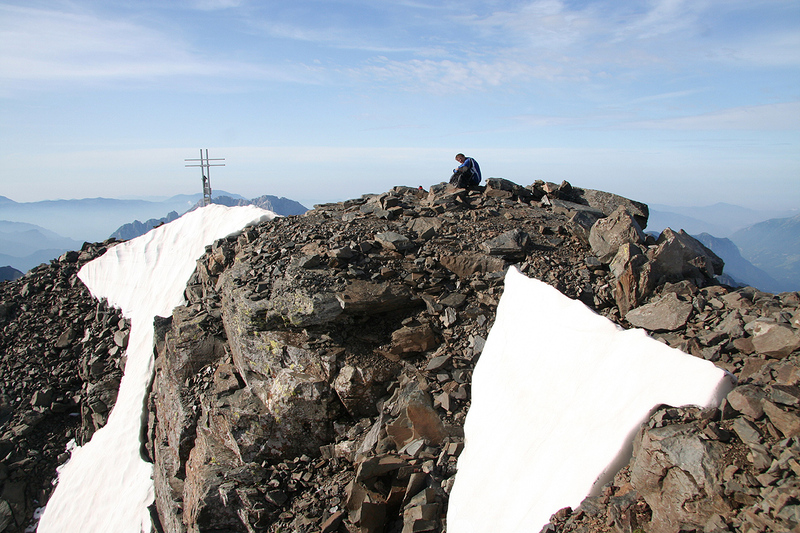 The summit of Pizzo di Coca is located only slightly more than 3 km in horizontal distance from the trailhead, but more than 2 kilometer higher, this route is therefore best characterized as a single long uphill that can be divided into two parts. To the (CAI) Rifugio Coca: From the parking, follow the road about 100 meter where there are good signs for Rifugio Coca. The trail leaves the road and runs downhill to the river that is crossed on a good bridge. The marked trail (no 301) now zig-zags uphill among boulders and trees. At two places there are trails that forks off to your right. However, your course is always uphill. At about 1600 meter the trail crosses a small creek and soon thereafter you can see the rifugio sitting high on a cliff on the left side of the creek. The trail climbs up to a small hydro electric plant used to generate power for the rifugio, then crosses the creek (again on a bridge), before leading the final few meter to the hut. 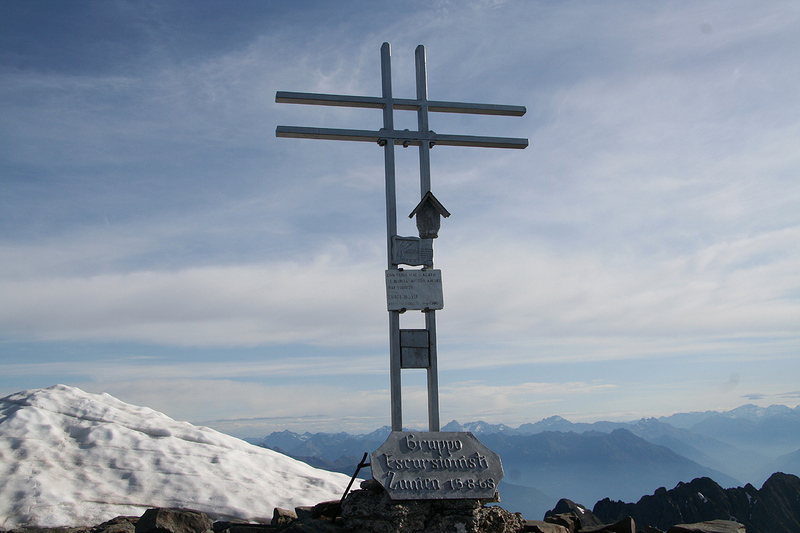 The Rifugio Coca is located at N46:03.286, E010:00.594, elevation 1892 meter. 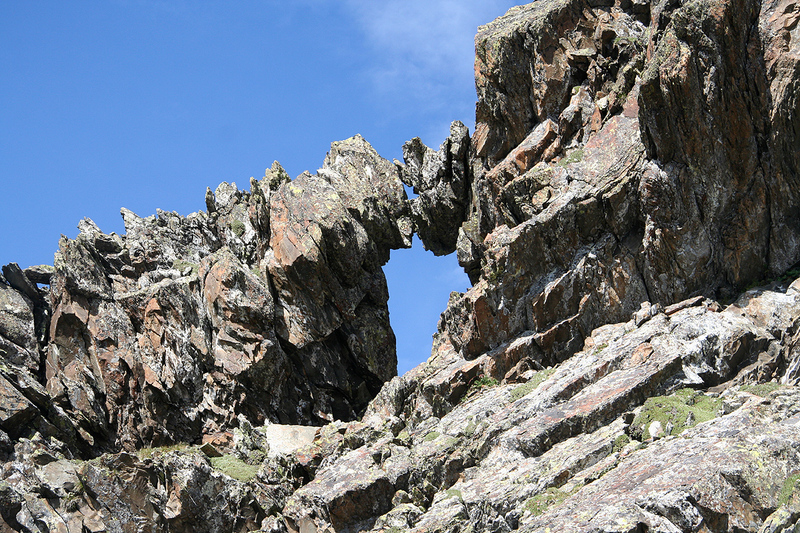 The rifugio has phone number: +39-034644045. To the Summit: The summit hike continues directly uphill from the hut (on trail 302), staying on the left side of the creek. 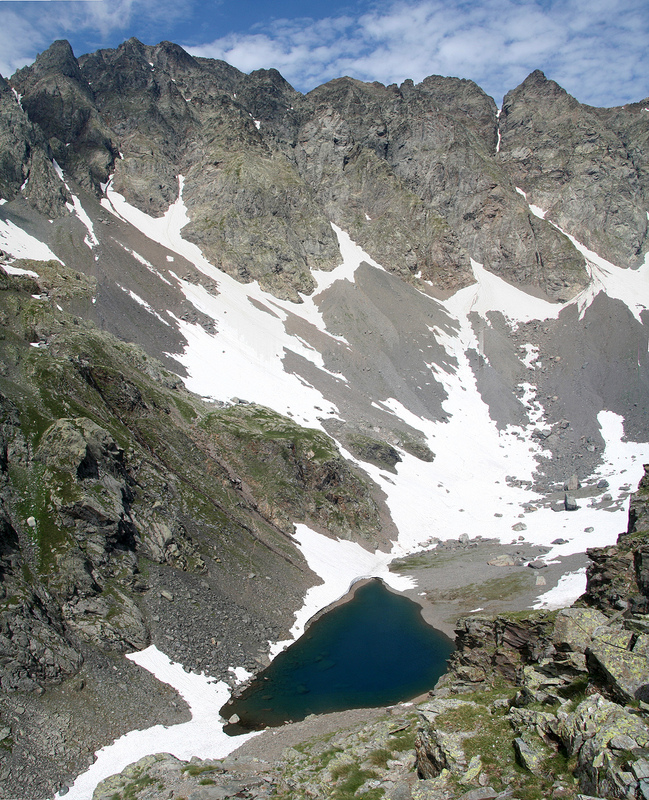 You will soon reach a small plateau with a single building, the valley then narrows as the trail climbs next to the creek up to the lake Lago di Coca (elevation approximately 2100 meter). The trail makes a sharp right here. This fork is before you reach the lake, look for some red paint uphill among the rocks. The trail is a bit fuzzy here and the trailfork itself may be covered by snow until late July. Follow the path more steeply uphill across the area filled with rocks, then enter a short, but pretty steep gully that may require the use of hands. This is the steepest part of the trail (number 323). Higher up, the trail becomes much better and clearer as it climbs the grassy hillside with views back down to the rifugio. 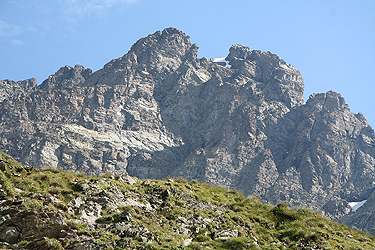 Following a broad ridge further uphill, the trail eventually traverses slightly right and heads more directly for the col named Bocchetta dei Camoscio at location N46:04.130, E010:00.880, with an elevation near 2719 meter. 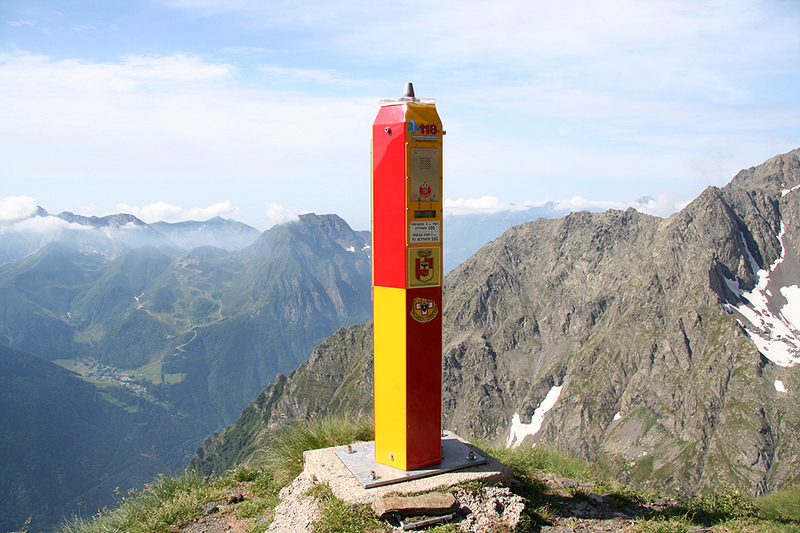 Before this, you walk by a red and yellow emergency communication pole, a system that can be used in case of accidents or other emergencies. 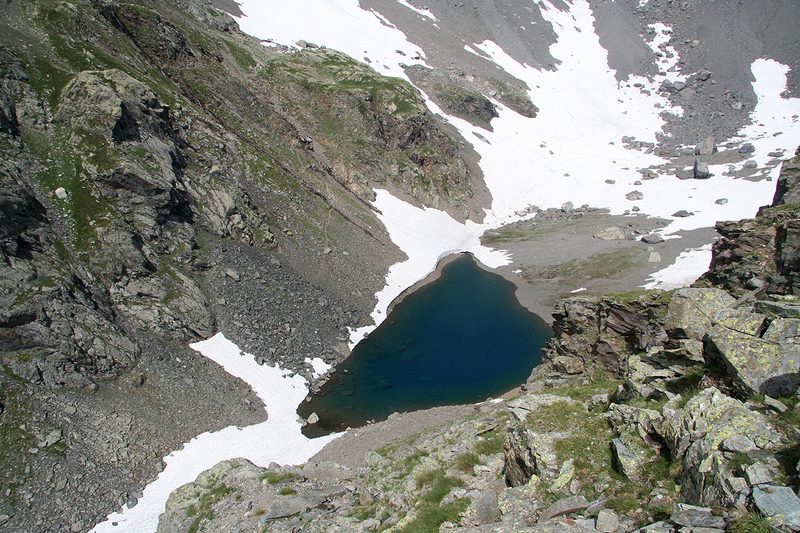 There are marked trails going both left and right of a small basin (with a snow field) before gaining Bocchetta dei Camoscio, the trail that climbs a small ridge on the right side (south) of the small basin is preferable, since the alternative traverses a pretty loose slope of talus. 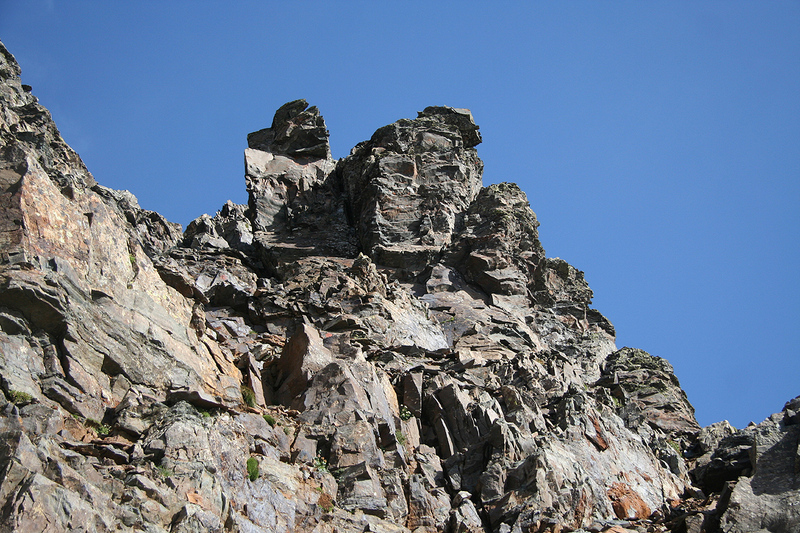 The summit route leaves the trail exactly at this saddle. 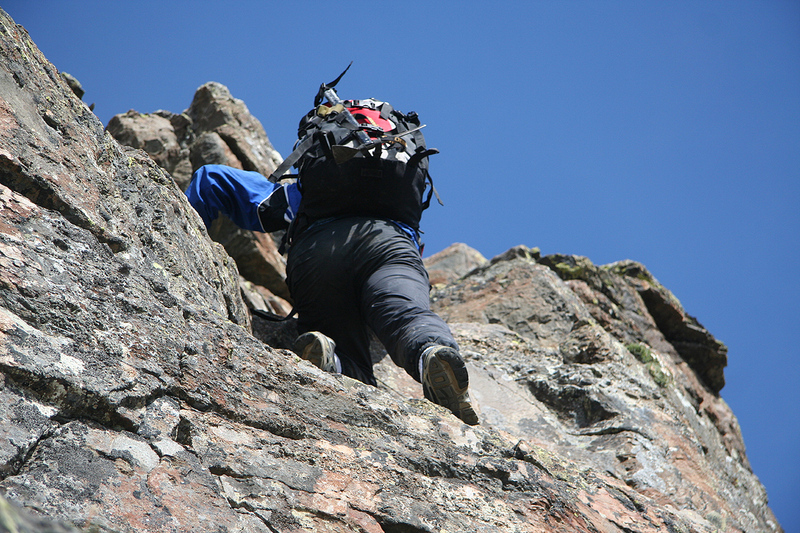 Head left (north) and locate an obvious gully that climbs higher slightly to your left as you face uphill. The route is further marked by red paint and several cairns. 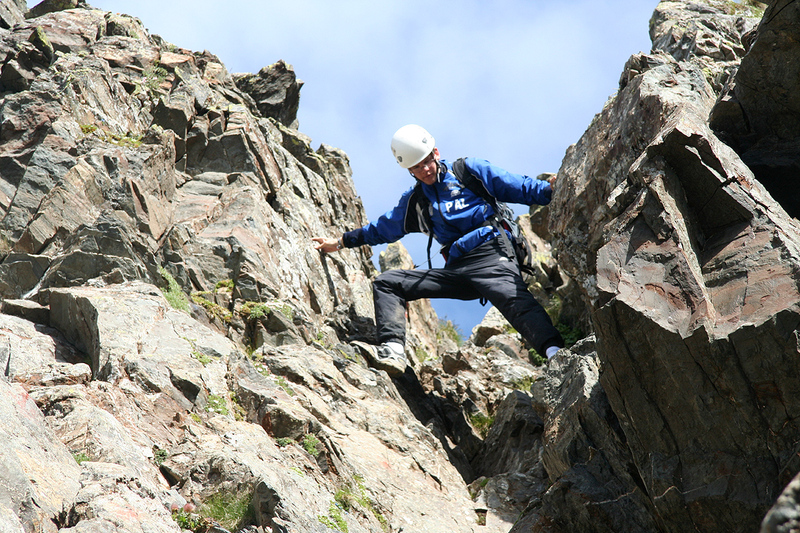 Climb this gully and continue a bit right where you locate a second gully, considerably wider. The climbing is easy scramble, quite prototype YDS class 3. In this area there is a route fork, white painting with an arrow pointing left says "Facile" (easy), while an arrow pointing more right says "Difficile" (difficult). 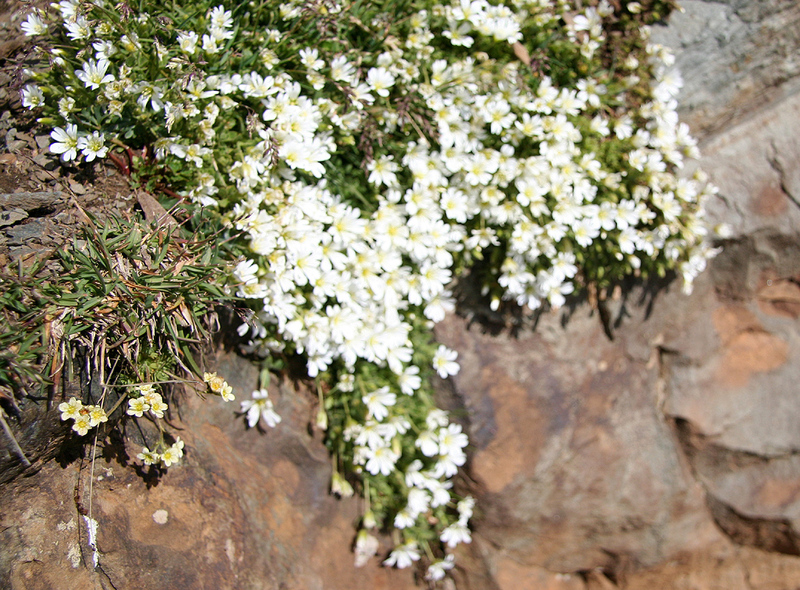 The (easy) route is well marked and most of the way easily followed on a climbers trail. A bit higher, there are again two choices, the easiest runs up a gully slightly left, while the alternative, perhaps with the better view, turns a corner and swings around in an arc to hook up with the first alternative a bit higher up. This variant has a single step that is slightly steeper, but still within a YDS class 3 level. Next, follows the steepest part of the route, however, on very large, flat steps, more or less like a steepish staircase. This section is absolutely straightforward, but with more "air" as you climb higher. 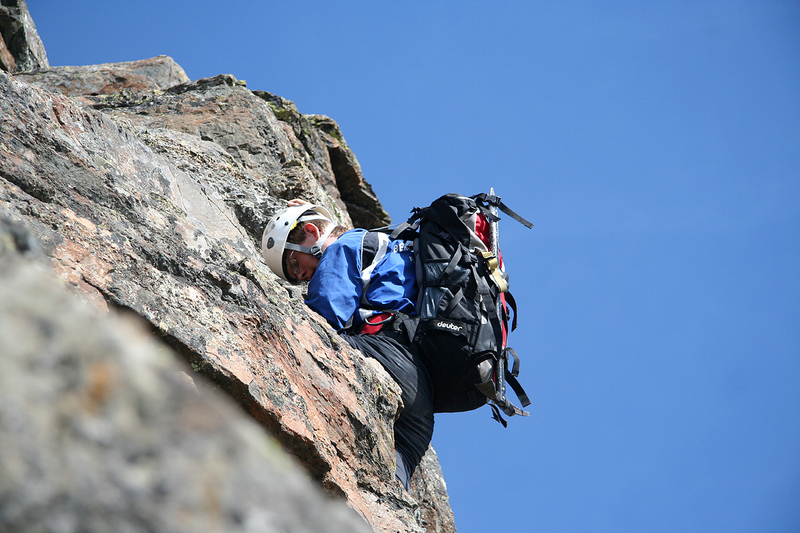 After this, the route regains the main ridge on a shoulder, then continues uphill across a south face where numerous ledges provide good zig-zag alternatives. Look carefully for the red markers in order to follow the easiest route, there are several variants that stay within a YDS class 3 (scrambling) level. 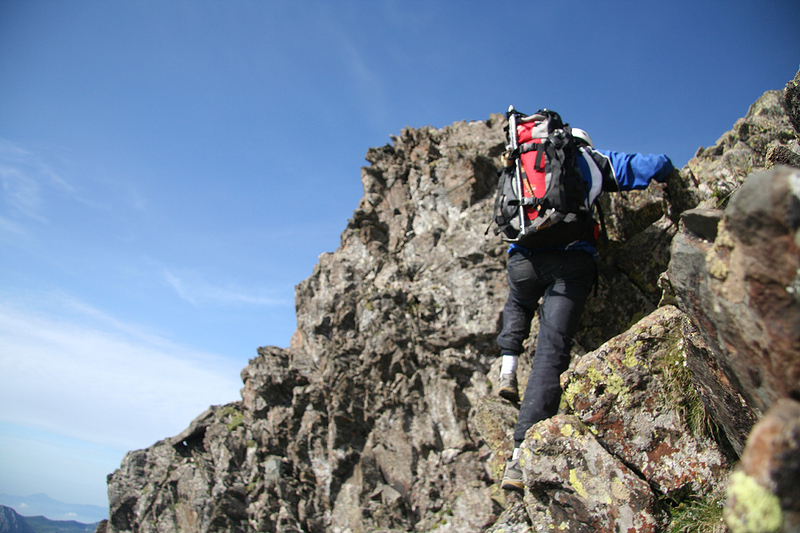 Before long, you will see the cross above you and with a few more steps you arrive at the summit. 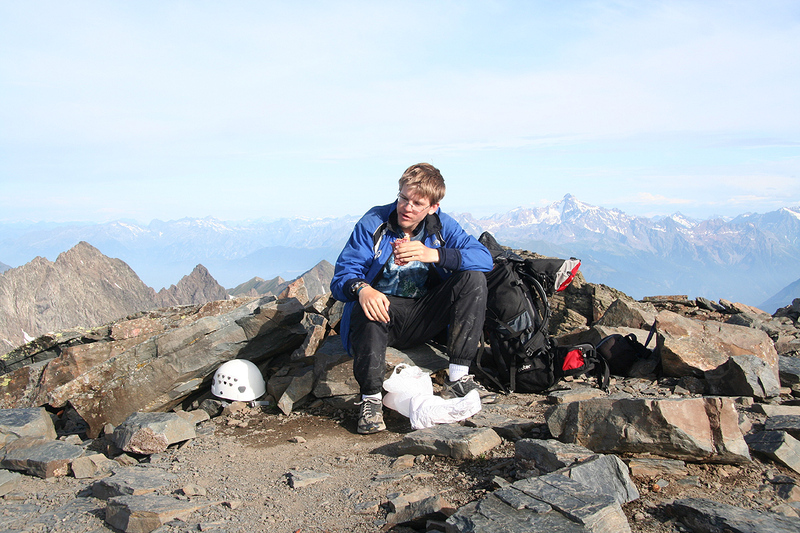 I did this climb with my son Pål Jørgen, age 20. We arrived in the small village of Lizzola on July 20th. and established our "family BC" there. There were nice trails starting out from this area where Heidi would make her next day hike. 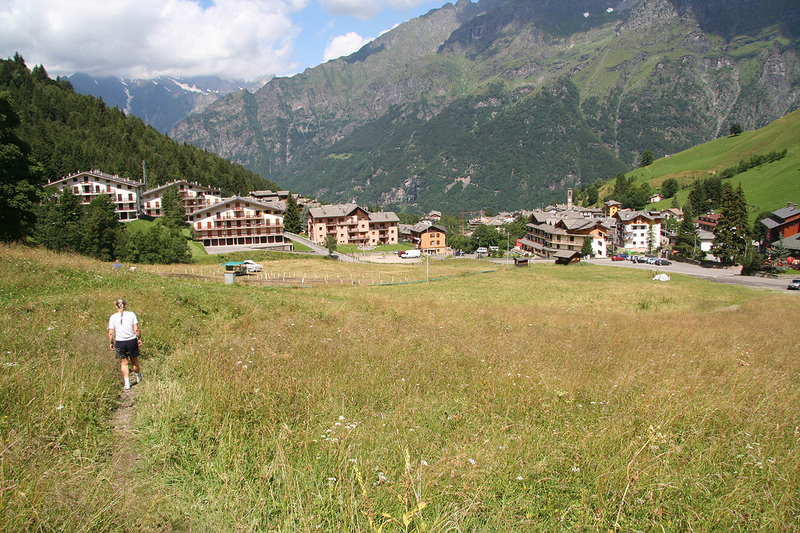 We drove back down to Valbondione, made a right turn and located a small parking area near the trailhead without any problems. After a short review of gear, we were on our way by 1415. The trail was nice and easy, but a very steady uphill on a rather warm day. We were quite happy to finally cross the creek at elevation 1600 meter, a break for water had been in high demand for some time as we started out without water in our bottles. 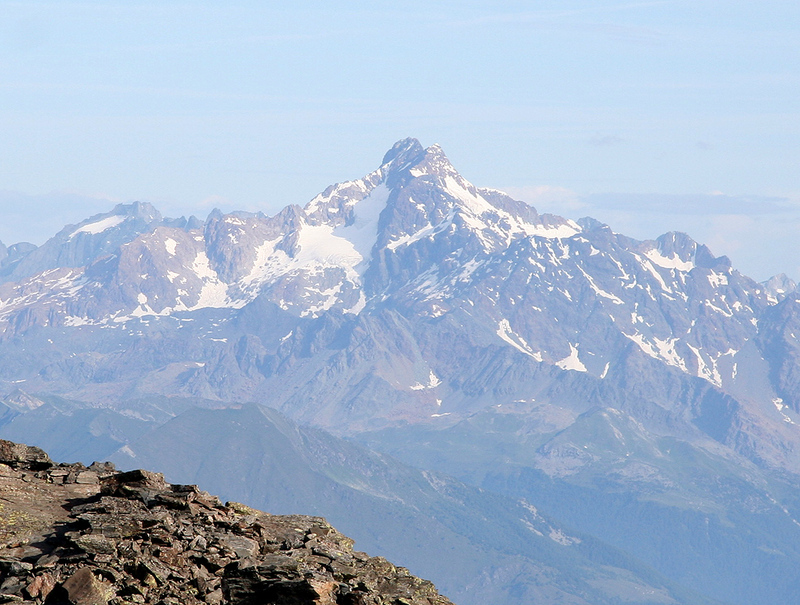 We arrived at the rifugio by 1615, and found only a few people there. 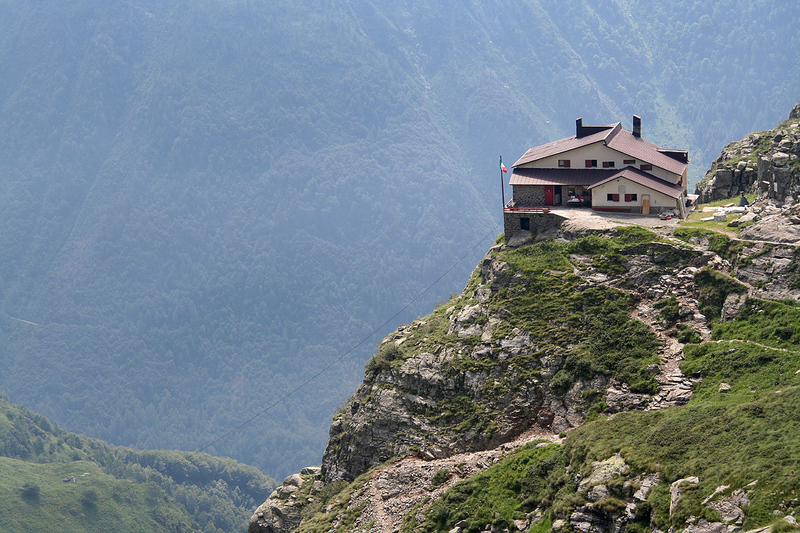 Just as on the Fridolin hut (on the Tödi climb) everyone were doing hut to hut walks and nobody planned to climb Pizzo Coca. We asked for a "self serve" breakfast by 0400 and got our private room upstairs. There were several men at the rifugio doing repair and/or remodelling work while we were there. After a nice dinner we went to bed early in order to catch sleep before our next day ascent. We left according to plan at 0515 the next morning. No need for light, it was a very clear and nice morning. Proceeding uphill along the trail, we soon arrived at the frozen lake, Lago Coca, and noticed that the trail climbed on the left side. Well, perhaps the trail needed to bypass some steeper cliffs, we expected to find our trailfork at the opposite end of the lake. However, our trail obviously climbed left and we scrambled down to the flat area beyond the lake. No trail to be seen. Concluding that we had missed the trailfork before getting to the lake made us walk back, this time on the opposite side. Eventually, we spotted a rather marginal trail crossing upwards among many rocks. This detour had certainly been a significant delay. Back on the trail, we ascended steeply. 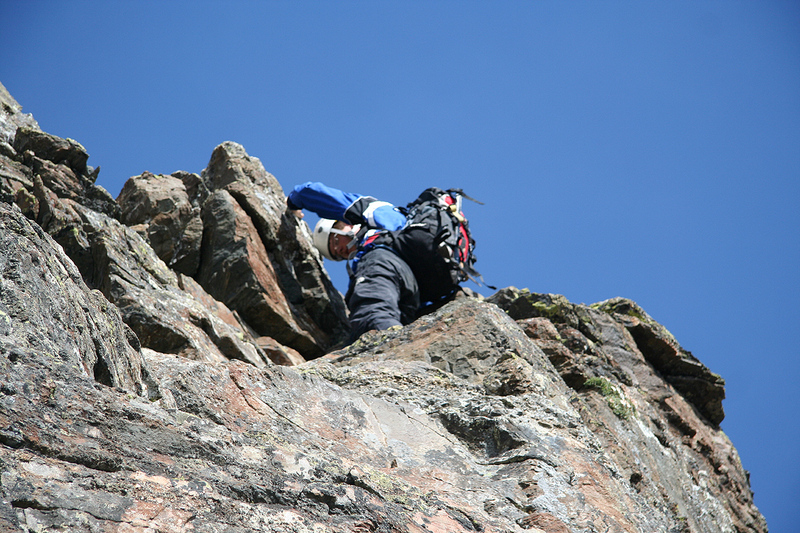 In fact, the trail has a short section of easy scrambling in a small gully in order to gain the better terrain higher up. From here the trail was very clear and easy to follow. Gaining the ridge, this trail climbs in such a way that you actually can look down back to the Rifugio Coca almost all the time. We spotted several nice ibex with impressive horns out for early breakfast grass, unfortunately, the early morning light was not ideal for my camera. Higher up, we arrived at the emergency communication pole, a system that could be used to alert of difficulties. 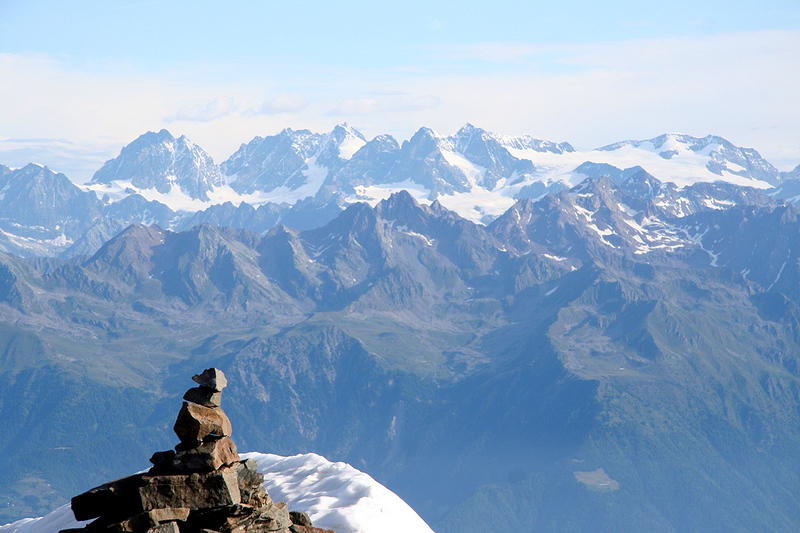 From here, we could see the Bocchetta dei Camoscio col on the opposite side of a snowfield. We decicded to turn this on the left side since we were still walking in light jogging shoes only. This choice was wrong as we entered very loose and unstable talus. Much better to go on the right side as we learned when descending. Arriving in Bocchetta dei Camoscio at 0725, we made a stop in order to prepare for the climbing section of the route. We decided to leave all heavy gear (crampons and ice axe as well as mountaineering boots), since the rock looked dry and since we had only seen very isolated patches of snow. 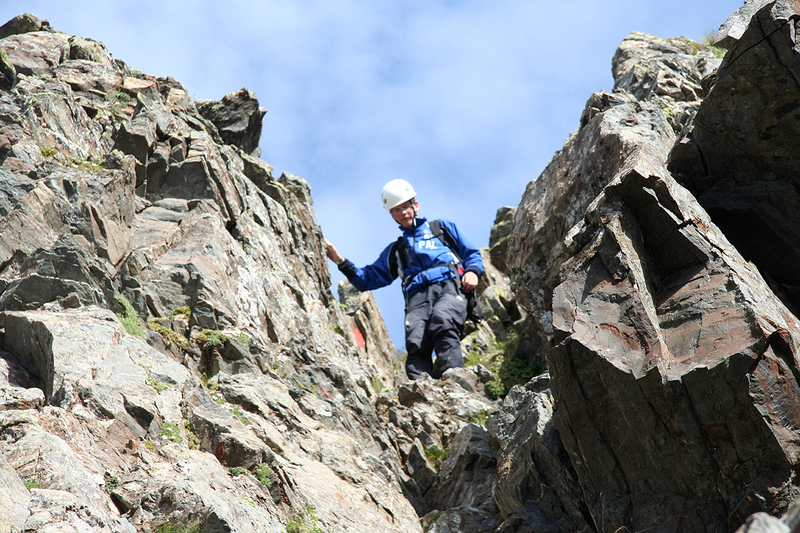 The route was well marked and the first scramble up a gully was clearly within a (YDS) class 3 category. Higher up, we turned the corner instead of going directly up a gully. 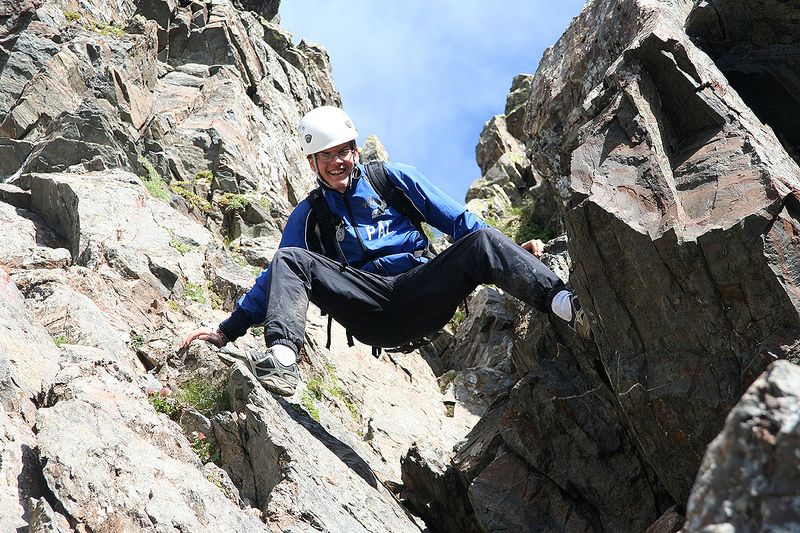 Fun scrambling without any hard sections. We then arrived at the steepest part of the climb, beautiful "steps to heaven". Very easy, but now going up at an angle that would be uncomfortable for people not used to "airy conditions". Obviously, a fall here would be dangerous, but the climb was like climbing a steep staircase - very easy. Higher up, we ran into one small snowfield, but it was easy to bypass on the left side. The rock was nice and solid, but seemed pretty eroded in places, even to the extent that we spotted a hole in the rock. The terrain was mostly dry rock and we were both happy that we finally climbed a peak where crampons, heavy boots and ice axe were needed. 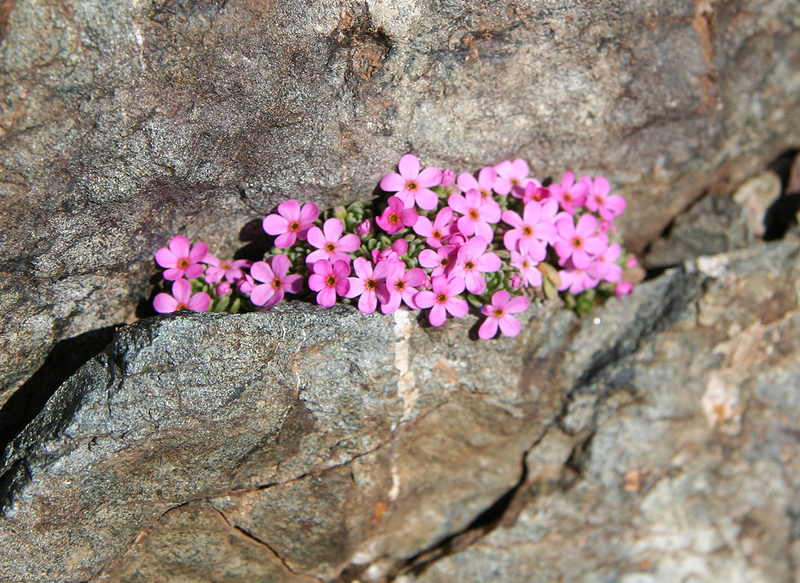 Incredibly, we spotted small groups of alpine flowers coming out of cracks that seemed essentally free of any soil to grow in. The climbing continued at (easy) YDS class 3 as we entered slope with ledges going across. The easiest route made a wide left turn that we both missed, but going more directly uphill did not get us into any difficulties either. We arrived at the summit by 0825 and felt that we were doing quite fine with respect to time, including our return to meet with Heidi. The weather was fine and the view fascinating. 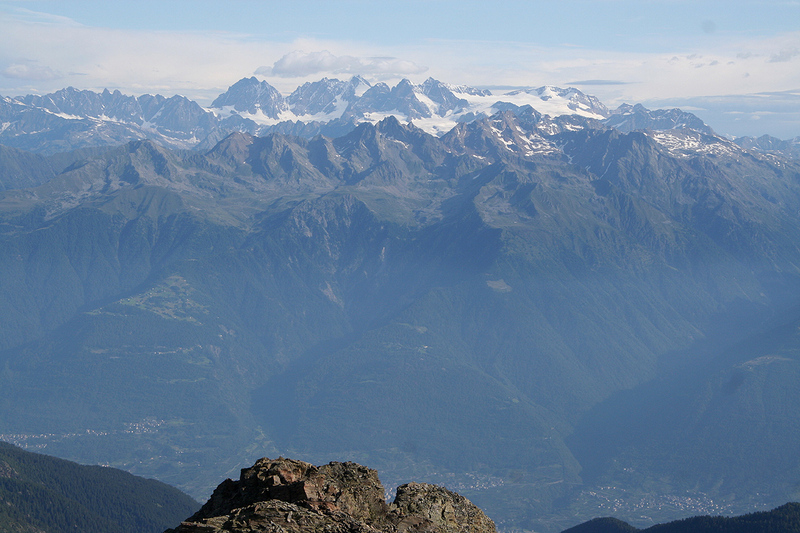 We could look back down on the rifugio, across (still down) to Lizzola and even directly back down to the village of Valbondione. 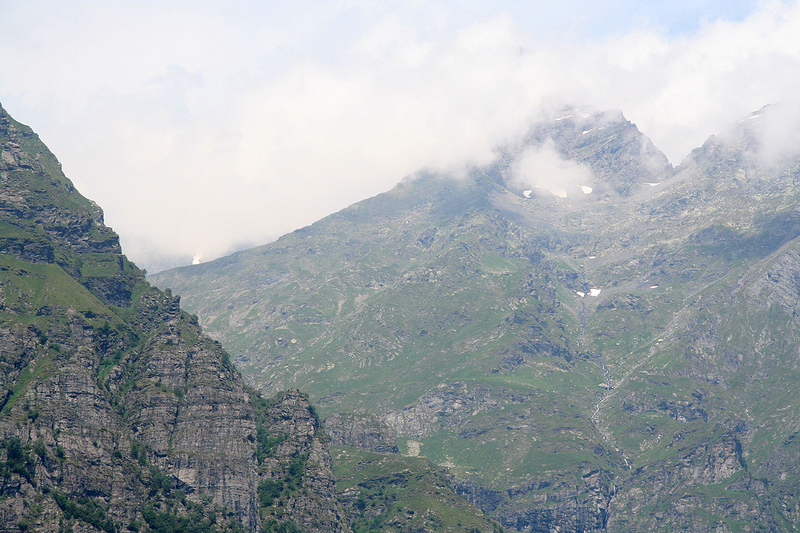 The Bernina group dominate the view to the north. A pretty big lake, Lago del Barbellino, 1862m, created by a dam further up the valley from Valbondione, did also catch our attention. 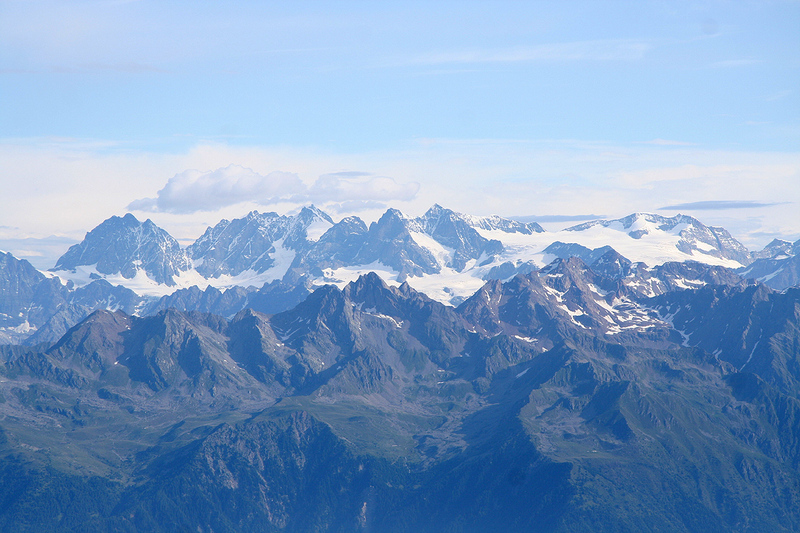 A fairly level summit ridge continued out to the north-west, otherwise we had immediate drops to all sides. We had lunch and decided to start back down after spending a bit more than 30 minutes on the top. Descending was an equally fun scramble as going up, soon we were back in the main col where we had left the heavy gear. 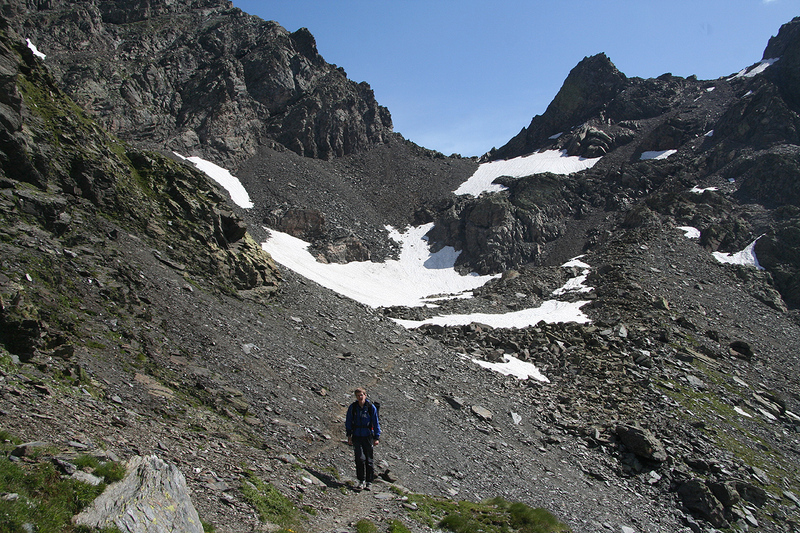 Descending further, this time taking the correct side of the snow patch, brought us back to the Rifugio Coca by 1115. We rested and paid our dues, then continued down by 1230. It took us 1:20 to hike back down to the car, arriving there by 1350. This completed our family summer trip in 2009. We travelled onwards to Como lake where we have a favortite hotel in Varenna. After two nights there, we drove to the airport in Milan and returned back home to Bergen, Norway on July 23rd. 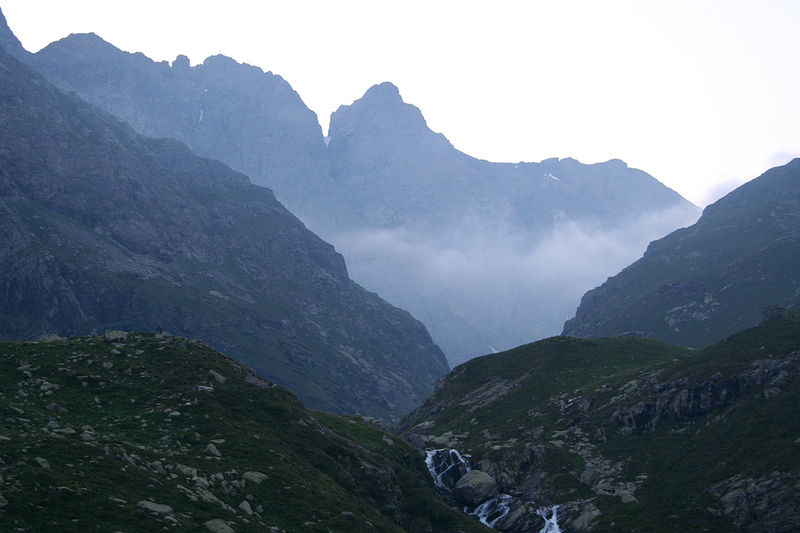 Pizzo Coca, hidden in clouds, as seen from below. 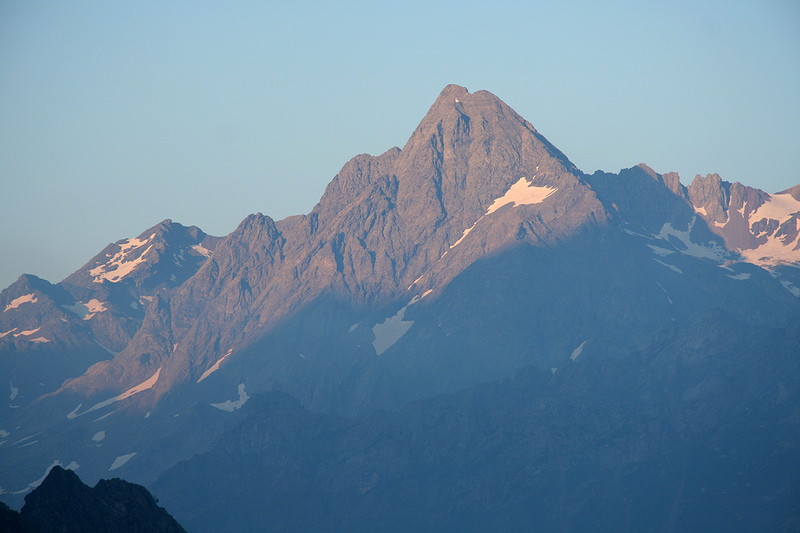 Morning sun, this is not Pizzo Coca, but a neighbor peak. 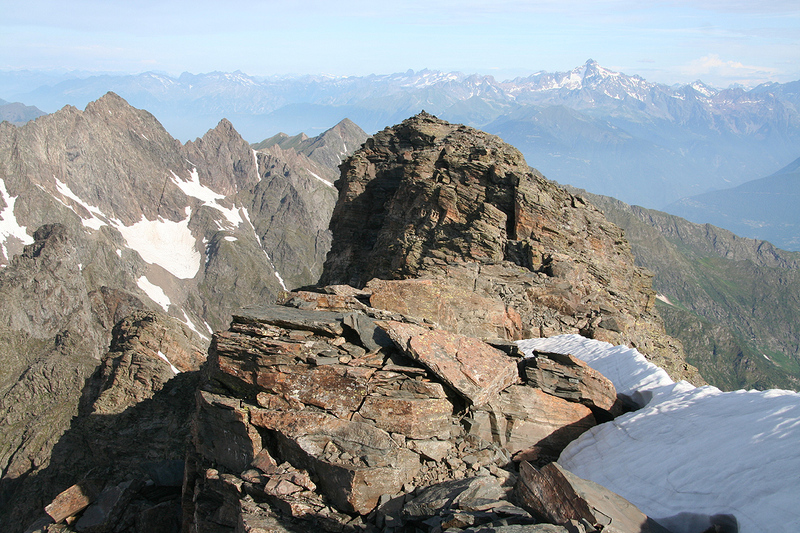 Pizzo Coca, the summit is to the right in the picture. 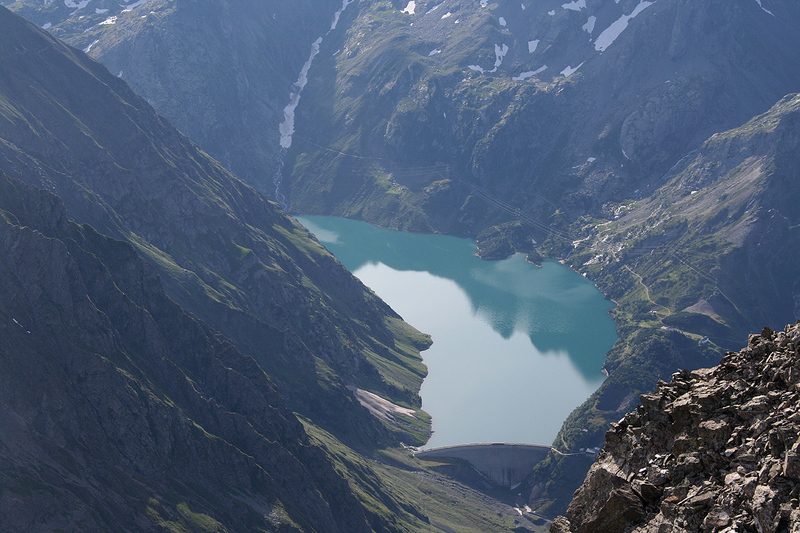 Lago di Coca, as seen when descending. 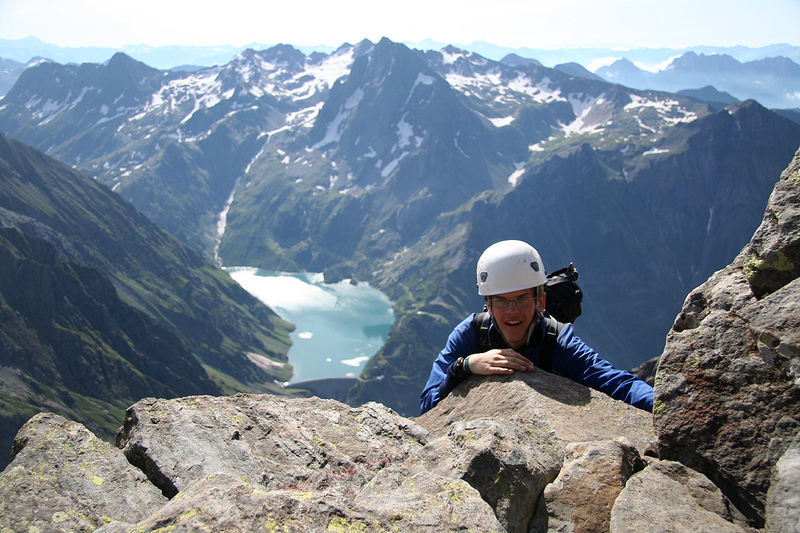 Pål Jørgen completes the steepest part of the climbing. 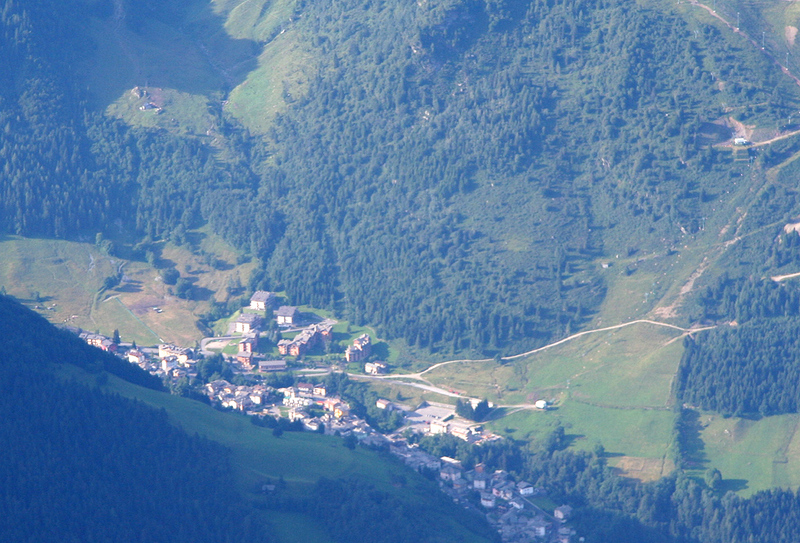 The Bernina group, as seen from Pizzo Coca. The Bernina group, a closer view.